NOTE: I first posted this article on my Facebook page. The 9GAG guy who created and posted this meme is factually, historically, politically and scientifically clueless! The truth is, capitalism is not a dictatorial system, thus it does not pick winners and losers. Capitalism is the only pro-FREEDOM, pro-LIBERTY social system and in a free market or PSEUDO-free market society (like America, Canada, Europe, etc. ), it’s the people or consumers who have the power to choose winners and losers. The system guarantees what Austrian economist Ludwig von Mises called “consumer sovereignty”. 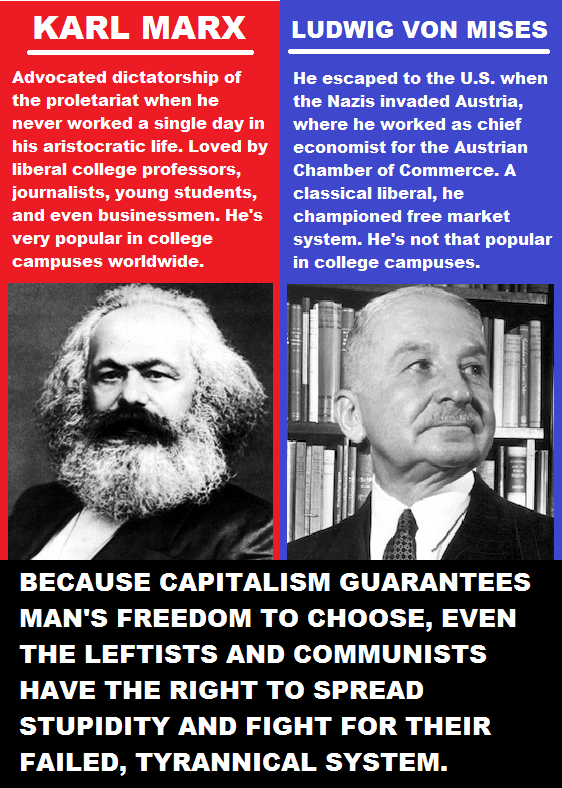 Since capitalism does not choose winners and losers and merely guarantees/protects people’s sovereign choice in the marketplace, it follows that there will always be markets for talentless people, brain-dead leftsts (in the universities), mediocre and corrupt politicians, bad and evil ideas, etc. Unlike socialism that seeks to round reactionaries and political contrarians up and send them to reeducation and concentration camps, Capitalism merely guarantees freedom and man’s consumer and political sovereignty. It does not dictate how people should choose winners and losers in the market. Now, it is important to understand that America is not a representative of capitalism or free market economy. Technically and by definition, America today is a Mixed Corporatist economy. It is a mixture of capitalism and socialism. According to the 9GAG meme-maker, it’s Capitalism’s fault that inventor Nikola Tesla did not capitalize on his talent and intellectual ability. That it’s Capitalism’s fault that he died a pauper. Well, I really admire Tesla and I believe he’s one of the greatest inventors who ever walked this planet. But Tesla was destroyed by his false sense of “humanitarianism” and altruism. 1. It’s a well-known fact that Tesla voluntarily WAIVED/RENOUNCED his royalties to help George Westinghouse, his business partner. His royalties would have been enough to make him one of the richest men in the world. In fact, many Tesla admirers and cultists even claimed that Tesla’s “waiving of royalties to help Westinghouse meant that Tesla would have to stoop to J.P. Morgan for main funding of Wardenclyffe.” He could have funded his own projects without relying on investors. Thus, Tesla’s decision not to collect his royalties was self-destructive. You can be the best inventor on earth, but that doesn’t guarantee you’d be good at everything. In other words, Tesla sucked at the financial aspects of the market. There’s one obvious yet undiscussed reason Tesla chose to migrate to America: It’s then booming Capitalist system. The whole of Europe 100 years ago was statist, socialistic or fascistic. America’s economic system guaranteed Tesla’s right to own his inventions and ideas. That same right was denied in his native homeland, Croatia/Yugoslavia/Serbia (or whatever!). Thus, he had no choice but to migrate to America in 1884. He officially became a U.S. citizen in 1891 when he was at the peak of his inventive powers. Here’s one BIG PROOF Tesla chose America because he wanted ownership of his achievements/inventions: He SUED Guglielmo Marconi for stealing his patents. So, it’s Capitalism’s fault that “talentless” Paris Hilton made more money than Tesla? I believe the 9GAG meme-maker should have been more honest and proposed a different system(e.g., socialism or fascism) that would FORCE people/consumers to pick winners and losers in the marketplace. Also, he/she should have been more honest and argued that Paris Hilton’s buying fans should all be FORCED (perhaps by law or political decree) to ignore her and to stop buying her products. It’s not possible at all to teach people not to be stupid. In fact, the 9Gag meme-maker is actually incredibly stupid. However, Paris Hilton may be a “talentless” singer or actress, but that doesn’t mean she doesn’t have other proprietary, money-making talents and abilities! She’s doing a great job marketing her own brand and products. One big fallacy about Capitalism is that MONEY determines success. That’s not true. In a free society, where consumers have the freedom and free will to choose, a hard-working piggery or thrift-store owner can possibly make more money than a conscientious, intelligent mentor or professor. Previous POLITICAL MEMES: Binay Clan, Who the Hell Do You Think You are?! You guys are so brainwashed. Pssh. — LOL! Ignorance is bliss indeed. You are a living proof. Capitalism IS a dictatorship. The dictatorship of capitalists against proletariat. There’s no such thing as freedom in capitalism. Take a look around the world (specially third world) and you’ll see. Know the concept of capitalism before spouting ignorant nonsense. You must be living in either Venezuela, Cuba or North Korea where the proletariat enjoy what you call non-dictatorship and freedom. Indeed, all leftists are brain-dead. I am sure you live in a MORE CAPITALISTIC society that the Philippines or Venezuela. You’re really funny, I give you that. FYI, I do not live in Venezuela, Cuba or North Korea, and even if I did, what difference does that make? I never said that they were non-dictatorship or enjoyed freedom (I am positive that they do not). That does not change the fact that capitalism slaves millions and millions of people all around the world. And that is not a “concept”. It’s just fact. Capitalism does ensure the freedom of a few first world countries. Only a few, and at the expense of the poverty and suffering of entire continents. That is not “pro-FREEDOM” or “pro-LIBERTY”. You better look at reality a bit (a mirror might be good) before calling people “brain-dead”. Oh the Clinton sound byte! What difference does that make? Well, you’d be able to experience what it’s like to live under socialist dictatorship. Again, know what capitalism is all about. Corporatism or Fascism is not capitalism. You don’t even know Fascist Mussolini and Nazi Hitler hated, rejected capitalism and rooted for national socialism. Stop being too stupid. May I suggest an android app that could view 9GAG without having internet connection? If you care, please visit this app on playstore. Before you call other people ‘clueless,’ maybe you should learn the difference between socialism and communism. Although most communist countries name themselves socialist, they aren’t. In fact, truly socialist countries have the highest standard of living in the world, the lowest infant mortality rates, the highest literacy rates, and the lowest rates of poverty and mental illness. Americans are brainwashed from birth to believe that capitalism is the greatest system in the world, but the truth is, capitalism is an experiment that failed. What you describe here isn’t socialism. no country has ever reached communism and besides have you read hustorical materialism? damn… Don’t calll socialism and communism a failure. It has been only around 100 yrs. please research and dont be a bigot. Capitalism enslaves millions? But these “slaves” are free to go! Find another employment or learn a new craft. And please name me one socialist state with a high standard if leaving. OH MY GOD! I sincerely hope it’s a joke. I can not believe what I’m reading! It does not dictate how people should choose? advertising, status symbol, mass media manipulation? a rich man can preserve his wealth only by doing the better for people? financial trading, dislocation, exploitation, Theft!?? Tesla was destroyed by his false sense of “humanitarianism” and “altruism”. What are you? Ebenezer Scrooge of a Christmas Carol? What do you think keep alive this society? greed and competition? maybe only to people like you! ok ok, you are kidding me now. tyrannical system? you’re confusing maybe with Stalinism and Maoism. Failed system? Communism as a society based on equality has never been tested. When you wrote this article, you were drinking? Well, you need to read more proper books to re-educate yourself. Better read more articles on this blog. That’s my honest and friendly recommendation. You’re clearly a brain-damaged socialist. — You think property is theft? Apple and Samsung did not become successful by offering crappy products to consumers. You don’t even know how to manufacture a product that people need. If you think it’s that easy to be successful in the market, I challenge you to compete with the existing market players by applying your simplistic understanding of the markets. — You’re the one who’s confused. The only difference between those two statist, collectivist, Marxist systems is strategy. And yes, they all failed. Unless you read a different book. — That’s hilarious. Why is it that when communists succeeded in establishing their own system, you no longer call it “Communism”? Well, it’s because communism is a unicorn system. Karl Marx did not invent socialism and communism. He merely conceptualized and popularized his own social/economic system. You can invent your own socialistic or communistic system and call it Utopian Communism. North Korea is very close to the standard definition of communism. In a socialist system we all have the means of living a good life without having to earn money to do so, so we can develop ourselves as free individuals intellectually and physicaly, so the wage labor is unnecesary, and because of that, there is no point in having money. LOL! You must be dreaming. Know the history of American enterprise. All the things you said were first implemented by early American companies like Ford long before social legislation or so-called workers’ rights were implemented. The government merely copied or followed up on the changes or improvements first introduced by private enterprises. Ever wonder why there’s no workers’ rights in Socialist countries like Soviet Russia and China and the working conditions in state-owned enterprises were many times worse compared to those of privately-run companies even in third world counties? It’s because state-owned ‘enterprises’ in socialist countries were heavily politicized and thus there was no incentive to innovate due to lack of competition. Marx worked as a journalist for a U.S. newspaper. Also Dictatorship of the Proletariat means a class dictatorship, in the Roman sense. This as opposed to the capitalist dictatorship that exists now. Also to say communism is a failed and tyrannical system is inaccurate because first of all, the soviet union was a completely industrially backwards country, contrary to Marx’s prediction that proletarian revolution would take place in the country with the most developed (largest) proletariat. Also, Stalin took power away from a democratic system of worker’s councils called soviets. Economically, any country can not really thrive in complete isolation, certain things must be gotten from abroad. Stalin’s dictum of “Socialism in one country” was unheard of before his time and quite transparently a break from proletarian internationalism as outlined by Marx. Conversely, your ideals of “true capitalism” as opposed to corporatism are nothing but ideals. We had free market capitalism for a time but it was short-lived. The division of labor and concentration of wealth makes large scale production a necessity. Imperialism has been the source of significantly more numerous deaths than what you say is communism. I’d suggest looking up Yahya Khan, Suharto, the Greek Civil War, the Shah of Iran, just to get an idea of what “corporatism” has done. A compromise would be a market system that is regulated enough that no monopolies will form, yet free enough that businesses will flourish. BTW, a state can be fully self-sufficient if it resort to medieval tech. Oh LOL. YOu know Marx worked throughout his life and was not a aristocrat right? LOL. Also to bad you’re god the sociopath Mises who wrecked the Austrian economy when he was working for Dolfuss wasn’t properly gassed. I won’t be surprised if you don’t post this because sociopaths don’t like to be told the truth. I think what the 9gag poster meant was that Tesla was ready to illuminate the world for FREE (or atleast tried to) . While other people (Eg: Edison and almost every other inventor) charge exorbitant amounts for their work with the sole idea of making themselves rich, thus the CAPITALIST mindset.